Welcome to our site. Charitable Confections is a volunteer-run, 501(c)(3) public charity that assists educational nonprofits in developing countries. We believe that children who were born into third-world nations shouldn't be precluded from receiving a first-rate education. Our hope is that by infusing a dash of creativity, joy, and sugar into the presentation of dire, often tragic situations, it will make the information more palatable to those who have the means to help but sometimes don't because they're scared or put off by other people's suffering. 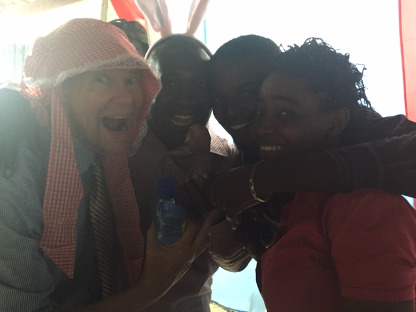 As Mother Teresa once wrote: "Joy is a net of love by which you can catch souls." Charitable Confections currently operates in Haiti and Armenia, via our two "charity du jour" or partner organizations, which are based in Cite Soleil -- the most destitute slum in Port-au-Prince -- and Yerevan. In addition to raising funds to sponsor childrens' tuition and assisting our partner organizations with editing and creative content for their Web sites, we have implemented an in-house tutoring program that is based on the "Pay it forward" ideology, a big brother/big sister Skype program and two Skype tutoring programs (peer-peer and adult-advanced student) in Haiti, and are in the process of launching a Skype guest lecturer series in Armenia with Harvard professors. We also curate our own curriculum content by recording original podcasts and videos of Harvard, MIT, and London School of Economics professors, celebrity chefs, and other professional luminaries, all of which is accessible for free on our site. Periodically, we host unique dessert soiree fundraisers featuring our edible robot called Confectionbot. 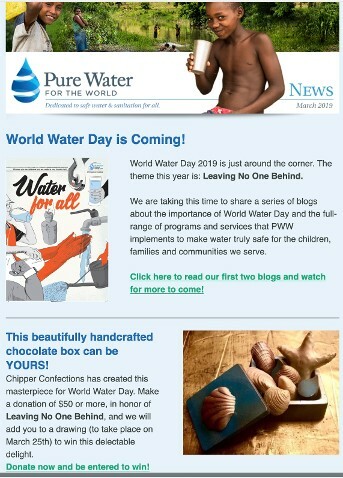 Our sister, Chipper Confections, collaborated with her partners at Pure Water for the World for a special chocolate box for World Water Day! 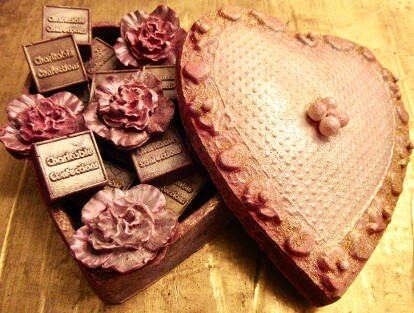 Linda will be teaching the first parent and child chocolate art class at CCAE/Harvard Square in April: https://ccae.org/classes/offering/2546/parent-and-child-chocolate-art . Thanks to the Boston startup Flutter for promoting and raising funds for us on their site: http://experienceflutter.com/charities/charitable-confections . We've been approved by PayPal to be one of the charities showcased on their site, via their Giving Fund program: https://www.paypal.com/us/fundraiser/charity/1436856 . Our supporters also now have the option to assist us by check or via Paypal or credit card on the "Donate" page of our site. We also have been included in Ebay's list of approved charities, so anyone who buys or sells things on Ebay can read about CC and choose to give a donation to us whilst shopping : https://www.charity.ebay.com/charity/Charitable-Confections-Inc./1436856 . 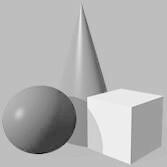 We've listed all of the books that our sponsored college student, Mathaus, needs for his upcoming winter 2019 courses on our page dedicated to his progress. 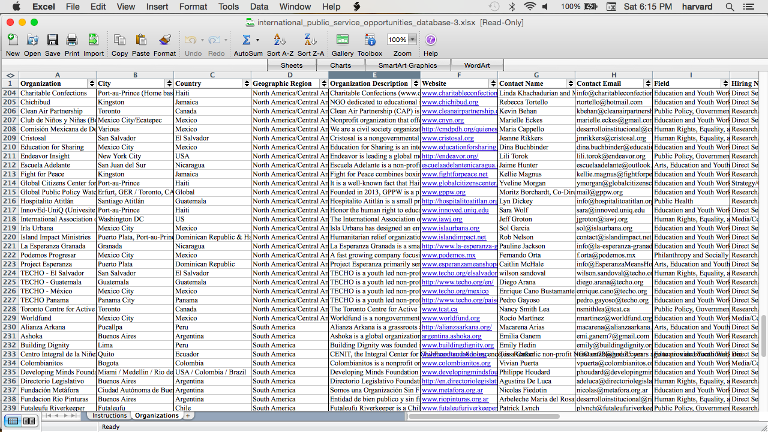 If you can lend/donate/purchase any of the books, please get in touch. 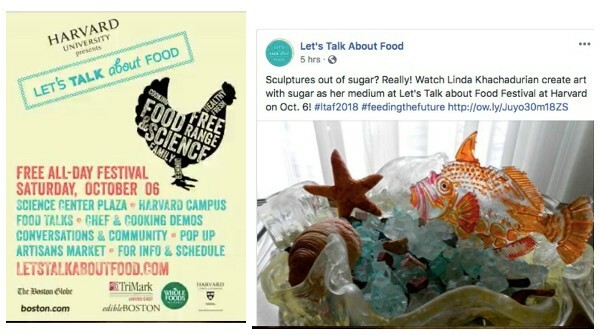 Linda will be doing sugar (isomalt) science & art demo at the Harvard's "Let's Talk about Food" event at the university's Science Center Plaza from 12:30-1:30p.m. 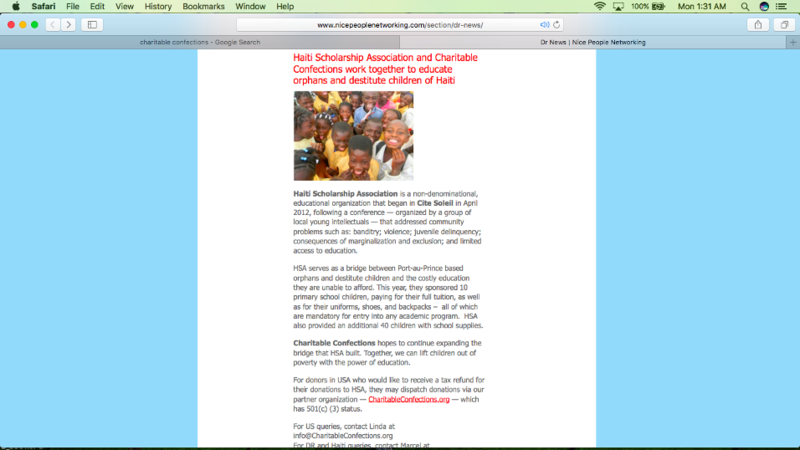 We have added a sub-page to our curriculum course section that is devoted to our Pay It Forward" tutoring program in Haiti: http://www.charitableconfections.org/pay-it-forward.html . Stay tuned for progress reports! We were delighted to have been selected as one of Boston's exciting companies/nonprofits for a hackathon hosted by Fidelity Labs and Boston Content. We will be implementing the great advice provided by the team of marketing experts provided to us for our "Pay it forward" in-house tutoring program in Cite Soleil. ***update July 2018: our glasses made it into the fall 2018 fall print catalogue as well! 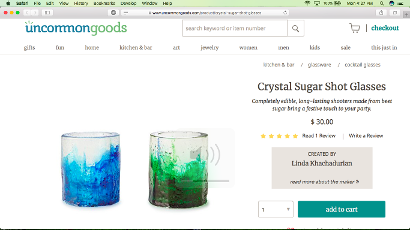 One of the painted sugar pieces from the collection of our sister www.chipperconfections.com is now being sold by the fabulous online retailer, UncommonGoods: https://www.uncommongoods.com/product/crystal-sugar-shot-glasses . Five percent of proceeds from all sales will go to our friends at Pure Water for the World, who have been great allies to our little nonprofit. 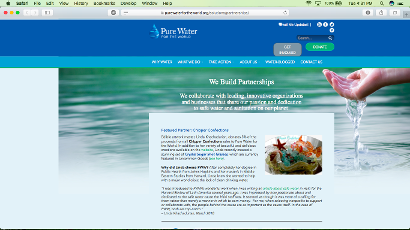 You can read about how we first met them here: https://revista.drclas.harvard.edu/book/making-water-safe-haiti , and more about our partnership on the PWW site: https://purewaterfortheworld.org/solutions/partnerships/ . Thanks, once again, to the National Restaurant Association and the Massachusetts Restaurant Association for providing our sister, Chipper Confections, with a free VIP pass to the New England Food Show. 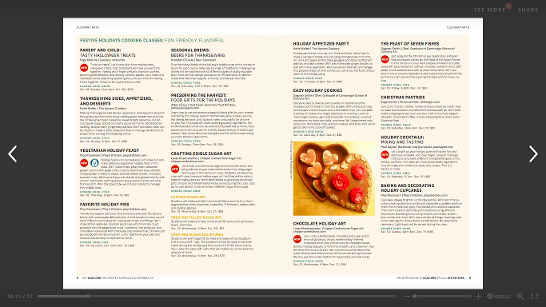 We're looking forward to it, and will be multi-tasking with Charitable Confections' brochures in hand to pass around. We have finally uploaded our "Attacking Poverty in Eight" and "Fun Facts in Five" podcasts and videos with luminaries ranging from Harvard, MIT, and London School of Economics professors Robert Hasserjian, Jan Wampler, and Dimitri Vayanos to celebrity chefs David Burke and Ming Tsai to an economic director at European Central Bank and an Alibaba global business executive on our curriculum page: http://www.charitableconfections.org/Interactive-Curriculum-Designing.html . We have also started a new series, entitled "Young Movers and Shakers," for which our Harvard College 2018 wintern, Janet Chen, just conducted the first podcast. Many thanks to our donors who provided the spring tuition funds for the first HSA student to make it to the university level. Learn more about Mathaus and follow his educational journey on the Web page we've dedicated to it: http://www.charitableconfections.org/mathaus--journey.html . We will be moving into a much bigger, gated HSA tutoring office in Cite Soleil in January. Thank you to our generous donors who made it possible to afford the rent! We will be one of the nonprofits at Harvard's Nonprofit and Global Health Fair that will be held at the Harvard student organization center at Hilles Library on Oct. 26th. Admission is open to all Harvard students at the undergraduate and graduate levels and recent alumni. Please stop by our table and pick up a pamphlet/learn more about our work: https://harvard-csm.symplicity.com/events/07a9c18fb973666433f6f8720521528b/employers . 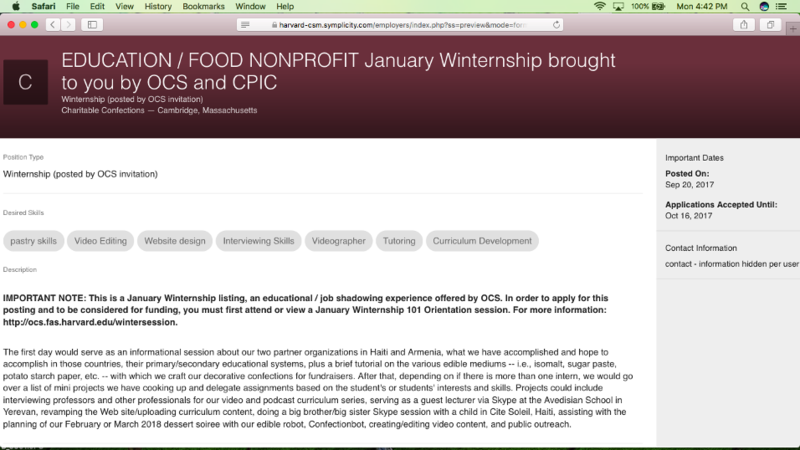 We were pleased to have been invited to partner again with Harvard's Center for Public Interest Careers and Office of Career Services for their January 2018 winter internship program. Linda had a great time doing her blowtorch sugar art routine at the Boston Globe-sponsored Let's Talk about Food Festival. 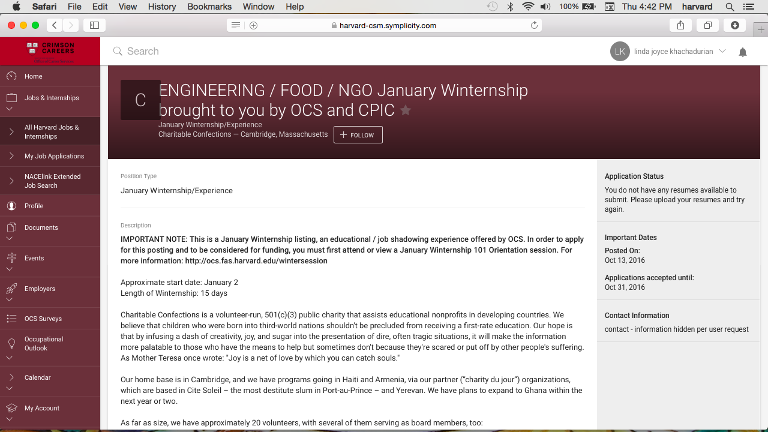 Thanks to the following Dominican Republic news site for featuring a snippet about our partnership with Haiti Scholarship Associaition : http://www.nicepeoplenetworking.com/section/dr-news . 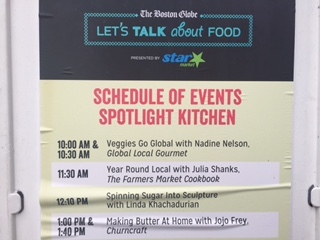 Linda will doing a repeat blowtorch sugar art performance in the spotlight kitchen at this year's Boston Globe-sponsored Let's Talk about Food event in Copley Square on Sept. 23rd: http://foodfest.bostonglobe.com/2017-schedule/ . 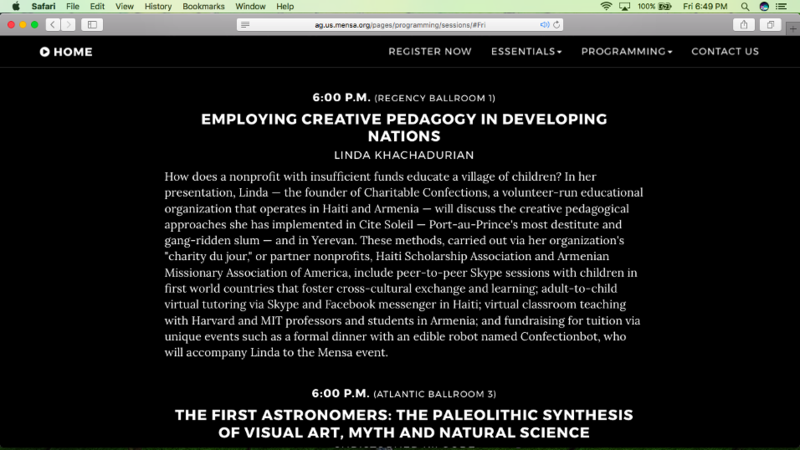 Linda will be giving another lecture at the national Mensa conference in Hollywood, FL on July 7th on the topic of our creative pedagogy. We are looking forward to, once again, participating in the Harvard alumni nonprofit event at the Harvard Club in Boston on April 19th http://publicservice.fas.harvard.edu/files/servicetosociety/files/2017_web_boston_nonprofit_board_recruitment_fair.pdf . If you are a local yokel alumnus, please pop by and say "Hi," and if you have school supplies you'd like to donate, we can accept them and take them over to Haiti during our upcoming summer trip. Thanks to the National Restaurant Association and the Massachusetts Restaurant Association for providing our sister, Chipper Confections, with free VIP passes to the smashing New England Food Show. Charitable Confections and our partner organization, Haiti Scholarship Association, are on the roster of Harvard's international public service summer fellowship programs. If you are an undergraduate and would like to spend the summer volunteering at our tutoring center in Cite Soleil, please consider applying! 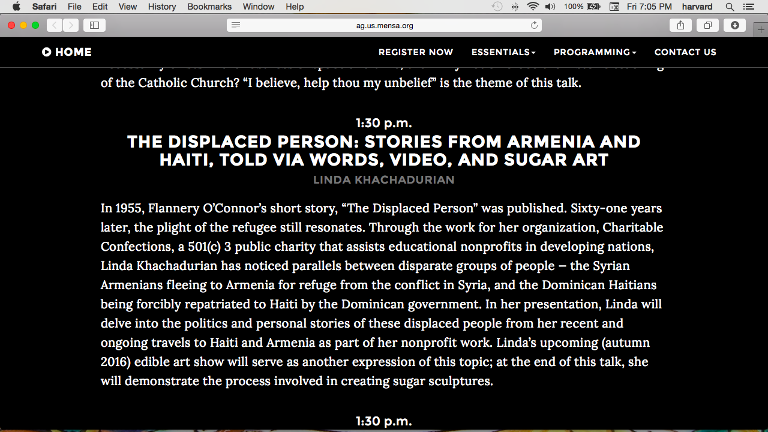 Queries: info@charitableconfections.org . We are so grateful to our Columbia University engineer volunteer, Khalil, and his brother for completing and safely transporting the base of our edible robot, named Confectionbot, to our Cambridge headquarters. Our beloved baby is home with us, and will soon be making public appearances before our fundraiser in winter 2018. 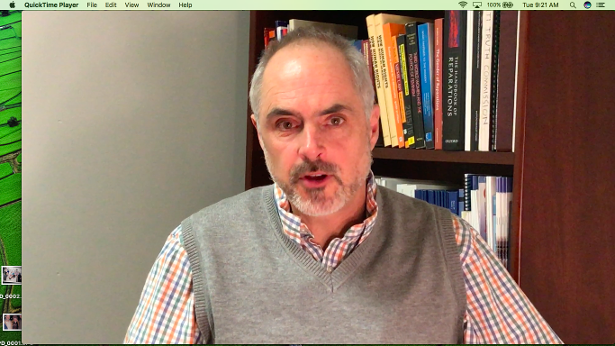 Many thanks to Esquire Brian Concannon for participating in our video curriculum series, and to the staff of Institute for Justice & Democracy in Haiti for graciously allowing our January interns to visit their offices and learn about their wonderful human rights work in Haiti. Many thanks to celebrity chefs David Burke and Ming Tsai, plus iconic cookie entrepreneur, Wally Amos, for participating in podcasts for our curriculum series. We were delighted to have been accepted to partner with Harvard's Center for Public Interest Careers and Office of Career Services for their winter internship program. During the January intersession we had three wonderful Harvard undergraduates -- plus our former U of Mass summer intern, who decided to return -- intern for us. Charitable Confections' founder and president, Linda, was on Radio Energy Boston's Friday night show http://www.radioenergyboston.com on the 9th, discussing our organization's tutoring programs in Haiti. Many thanks to Duke, congenial host of the show, who was interested enough in our programs to become one of our new volunteers. We were honored to have been invited to a special briefing on human rights and refugees at the Armenian Embassy in Washington, D.C. on the 3rd. 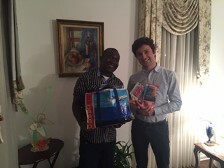 We hosted our third annual Snack, Learn, and Go Soiree with Haiti Scholarship Association president Marcel Jean and volunteers and board members from our organization on the 6th (in Princeton this year, instead of Cambridge). 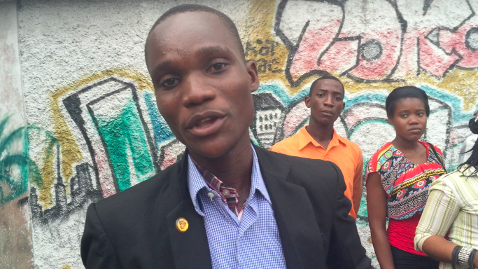 Marcel returned to Haiti with a posh Macbook, wireless router, and a big bag of school supplies that were generously given to us by our donors. 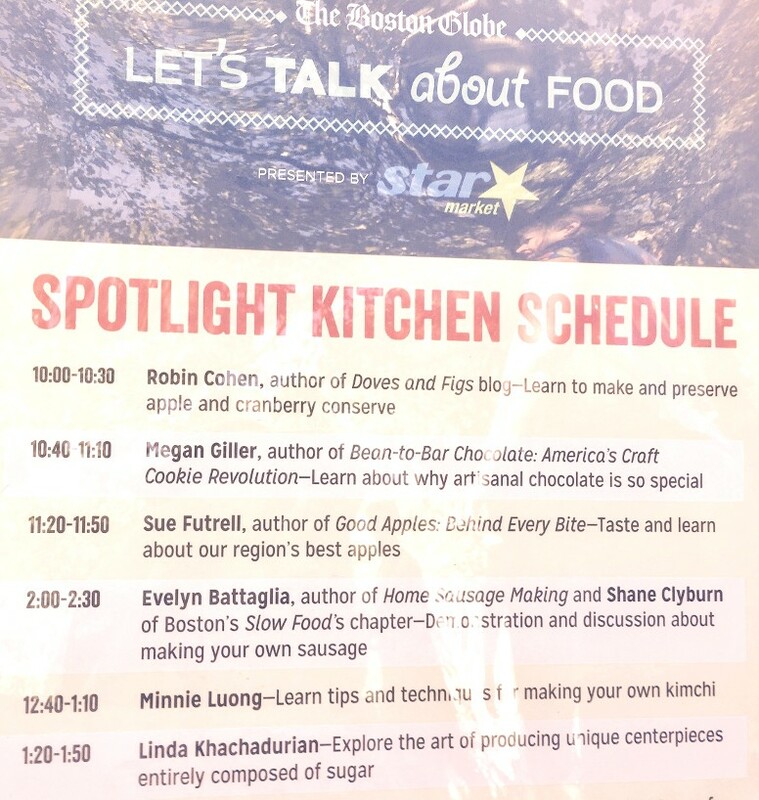 Linda did another sugar art blowtorch performance at the "Let's Talk about Food" festival on Oct. 1st, which was part of Harvard/MIT Hub Week. 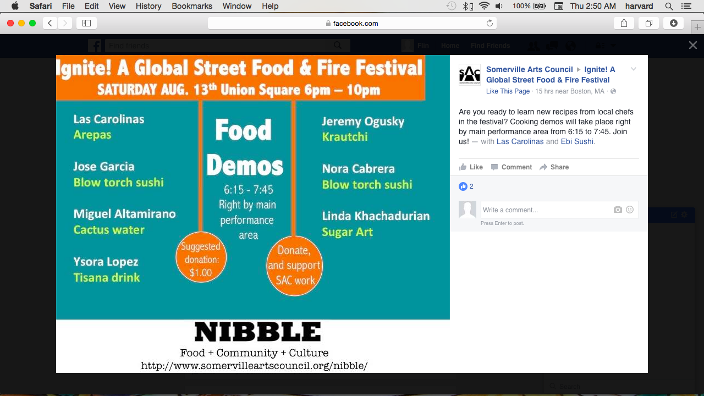 Linda will be doing her blowtorch sugar art performance and talking about Charitable Confections' projects at the Ignite Fire Festival on the 13th. 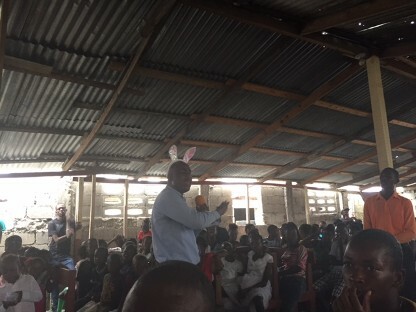 On July 21st, we hosted an event with Haiti Scholarship Association and our friends at Pure Water for the World at a church in Cite Soleil to herald the launch of our new in-house tutoring program in Haiti. For reasons that we need not go into, we were all pretending it was still Easter -- hence the bunny ears, Easter bonnet, and decimated chocolate rabbit in Marcel's hands. 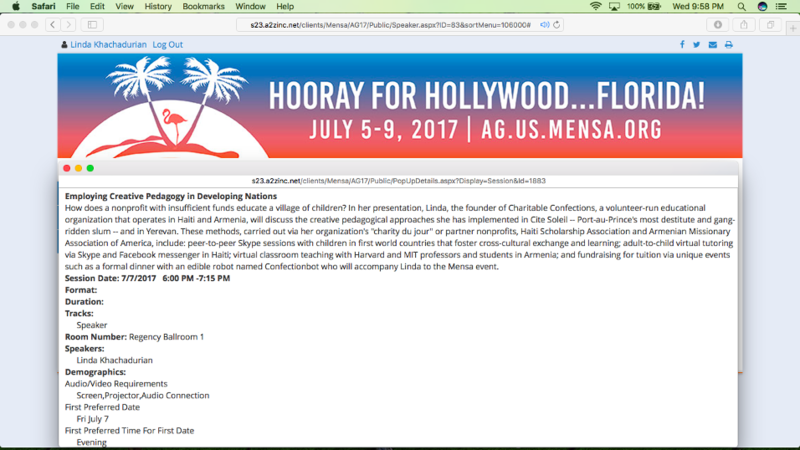 Linda's lecture at the national Mensa conference in San Diego on July 2nd. We were fortunate enough to have a few of the Mensa members at this event volunteer for our new tutoring program. We launched both our peer-peer Skype tutoring program with the Decroly School in Madrid and our adult-peer Skype tutoring program; both to benefit the children in Cite Soleil. We're looking forward to returning to the Harvard Nonprofit event at the Harvard Club Boston on the 25th. We had a magnificent time in Yerevan, touring the schools and learning center of our charity du jour Armenia, the Armenian Missionary Association of America/Yerevan branch. We received our 501(c)(3) status from the IRS! We were honored to be invited to and craft the sugar sculpture centerpiece for the Armenian Missionary Association of America's (our newest charity du jour) gala with Placido Domingo in Los Angeles. Our second annual Snack, Learn & Go Soiree in Cambridge with Haiti Scholarship Association and our States-based friends from Pure Water for the World was a great success. Welcome to Amrow, our first summer intern from U of Mass! 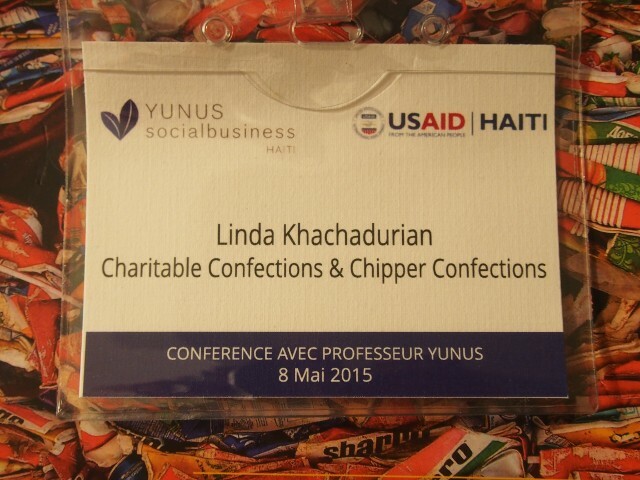 We were thrilled to have taken part of the Yunus Social Business/USAID conference in Port-au-Prince last week. The edible necktie that Nobel Prize winning economist, Prof. Yunus, was gracious enough to model for us will be put up for auction to raise money for our charity du jour, Haiti Scholarship Association . We were delighted to have been one of the featured organizations at Harvard's non-profit fair at the Harvard Club on April 27th: http://www.cpic.fas.harvard.edu/icb/icb.do. 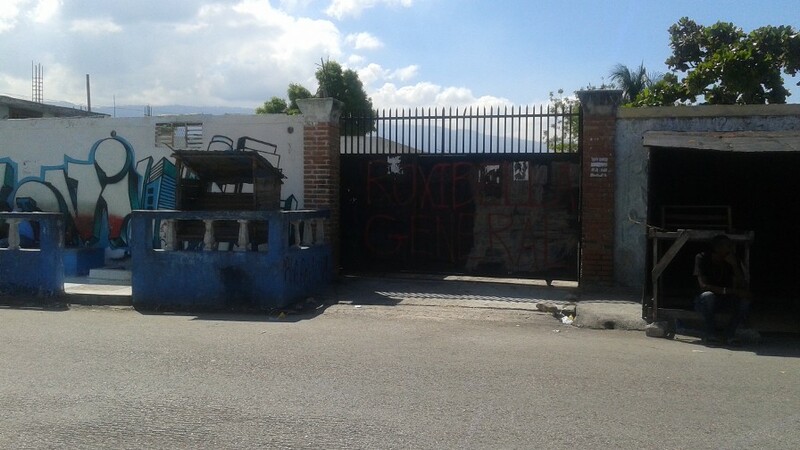 **** CC founder and president, Linda's, article for the winter 2015 edition of the Harvard Review of Latin America that is, in part, about our school project in Haiti, can be read here: http://revista.drclas.harvard.edu/book/haiti-time-trash.